While this buck is an eight point, it is a young deer. The narrow face, skinny neck and slight build give away its age. At one time not so long ago, it was enough on most leases or hunting operations to determine if an approaching buck had at least eight points before releasing an arrow or squeezing the trigger. Indeed, at some places where quality deer management is observed in its most basic form, that is still the case. But more and more, as the age class of the local herd improves as a result of selective harvest and improved nutrition from better food plots, operators and club managers demand hunters not only identify a buck's rack meets certain size requirements, but also that the buck is a certain age. This is so as to not squander the life of a nice buck which had the potential to become a ridiculous-size beast in another year or two. Whereas even the most ardent QDM adherents will rarely begrudge a guy a shot at a 3 1/2-year-old eight-point with heavy beams, most outfitters today will wince at the taking of a 2 1/2-year-old 10-point, realizing the jump in size such a buck could truly make if given just one more year to grow. For this reason, it's increasingly important for management-minded hunters to determine the age of a buck in the field fairly accurately. "We manage primarily for age on our farm, which in turn allows us to manage for antler size," says Matt Duffy, who, with his father, Martin, operates The Country Lodge (thecountrylodge.com) along the banks of the Wabash River in New Haven, IL. To them, managing for a heightened age class allows bucks with the genetic ability to reach true trophy potential. 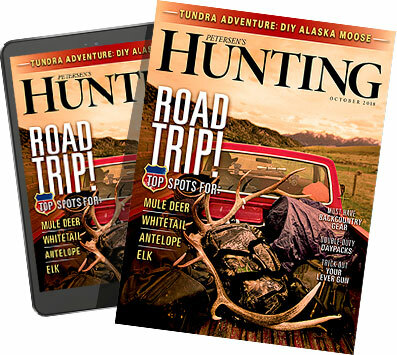 "If a guy just goes off antlers, particularly somebody not used to seeing big-bodied deer with heavy racks, he will tend to underestimate the true trophy status of the animal. A whitetail doesn't really reach his trophy potential until he is at least 4 1/2 years old," Duffy says. For that reason, hunters should focus on judging a buck's body first and study the antlers to be sure this is the buck they are seeking. Here are some basic guidelines as provided by the Quality Deer Management Association (qdma.org) on how to judge a buck on the hoof. A buck of this young age sports a narrow, pointed face along with a slender neck. He most closely resembles a doe with antlers at this time in his life--antlers that can vary widely, ranging anywhere from short two- or three-inch spikes to a well-formed, albeit thin, basket-size eight-point rack. Tarsal glands on the inside of the rear legs will appear small and have a very slight coloration. Two and a half remains the average age of most bucks taken during hunting season across North America. Indeed, even at this young age a number of whitetails are capable of sporting impressive racks, but they still have a lot of growing to do. For this reason, many game managers prefer to see the 21/2-year-olds walk. You can properly judge one of these deer. Although their bodies are beginning to fill out, their backs and stomachs remain flat and taut. They have longer legs and appear gangly. Their faces are still long and pointed like last year, and their rumps are squared off, not rounded. The tarsal area will begin to darken. 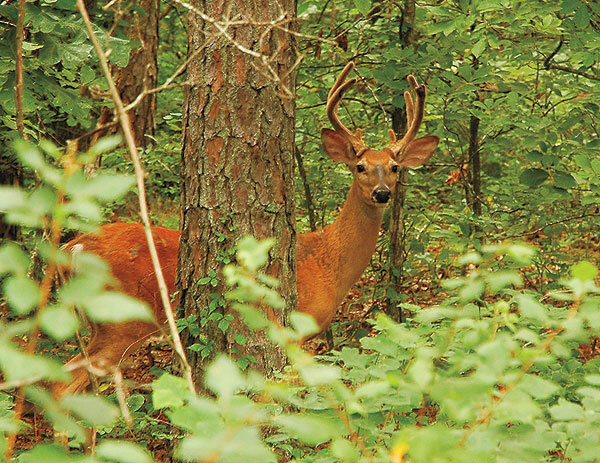 When most bucks hit this age, many hunters will find it hard to pass them up. Antler growth should really be picking up here, particularly in areas with great genetics, such as throughout most of the Midwest. Few outfitters or fellow hunters will begrudge the shooter the chance to fill his tag on this deer as long as the antlers meet established minimums. The buck's neck is really filling out at this age, and his chest has deepened, making for a more pronounced brisket. In fact, the neck should be wider than the head and face during the rut as hormones cause it to swell. The swollen neck combined with a broader nose will make a 31/2-year-old's face appear shorter as well. Legs are more in proportion with the rest of the body, and the back and stomach are beginning to develop a slight paunch. Tarsals are getting increasingly dark. The rump is becoming more rounded. If nutrition and genetics are good, the antlers will be impressive--too impressive for most hunters to pass up--but if you are hunting your own land or a lease where you are the only or one of a few hunters, you may still want to let this one walk. The best is yet to come. If a buck is ever going to achieve true trophy potential by today's standards--racks of 140 inches or greater, depending on where you hunt--this is the age where it's going to be realized. Bucks now look fully mature, and necks are muscled and, during the rut, much thicker than the head. The rump is completely rounded, and legs are in proportion to the body, even making the buck appear squat. During the rut, the tarsal area is large and dark. "It's pretty hard to expect a guy to hold off on shooting any 4 1/2-year-old buck unless it is missing an antler or something," says Duffy. Once a deer reaches this age, it's virtually impossible for the average hunter to tell whether the deer is 5 1/2, 6 1/2 or older. Realistically, it won't matter much. You're going to shoot this deer in nearly every circumstance. The deer's rack has likely reached maximum potential. He may hold it for another year or two, but by age 7 1/2, deer are hitting old age and, like elderly humans, will begin to lose mass. At 5 1/2, a buck's back and belly are starting to sag, and skin will begin to appear loose around the face. Eyes will appear almost squinty. Tarsals are dark as mud and stand out visually from a distance. This is the point where an otherwise typical rack begins to take on real nontypical trophy features, such as split brows, drop tines, palmated beams and stickers.